"I see you're over a month late for your appointment. Don't you know that nervous disorders require prompt and regular attention? What's your excuse?" "I was just following your orders, Doc." "Following my orders? What are you talking about? I gave you no such order." "You told me to avoid people who irritate me." Unfortunately, we don't always have the option of avoiding people who irritate, people who hurt us, people who offend us. In fact, sometimes those who irritate us the most are found right in our home (or in our church building). So how should we deal with them? The bottom line is that we do not overcome evil with evil by retaliating! Manage your mouth: Bless and don't curse. Bless those who persecute you. Don't curse them; pray that God will bless them (Romans 12:14 NLT). Put yourself in the other person's place and try to understand their feelings, thoughts and position. Be happy with those who are happy, and weep with those who weep. Live in harmony with each other. Don't be too proud to enjoy the company of ordinary people. And don't think you know it all (Romans 12:15-16)! Never, never, never take revenge. Dear friends, never take revenge. Leave that to the righteous anger of God (Romans 12:17-19). Plan ahead to do something beautiful. Do things in such a way that everyone can see you are honorable (Romans 12:17). Don't just win the war, win the peace. Dear friends, never take revenge. Leave that to the righteous anger of God. (Romans 12:19). Don’t let evil conquer you, but conquer evil by doing good (Romans 12:21). It is never easy to respond to those who do us wrong in a way that is godly, but it is only by following the example of Jesus Christ that we can truly have an influence on the world around us. But when you do good and suffer, if you take it patiently, this is commendable before God. For to this you were called, because Christ also suffered for us, leaving us an example, that you should follow His steps... (1 Peter 2:19-20). 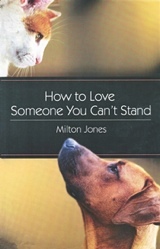 "Loving Someone You Can't Stand" by Alan Smith is licensed under a Creative Commons License. Heartlight encourages you to share this material with others in church bulletins, personal emails, and other non-commercial uses. Please see our Usage Guidelines for more information. Are you as smart as a mule?